After initial doubts, Jonathan Empson adapts remarkably quickly to luxury cruising across the Great Australian Bight. Silversea, privately owned by an Italian family, calls itself the “World’s Best Small Ship Cruise Line” and has a swag of awards to justify its claim. It has the highest space-to-guest ratio in the industry (well, according to some arcane calculation method anyway). 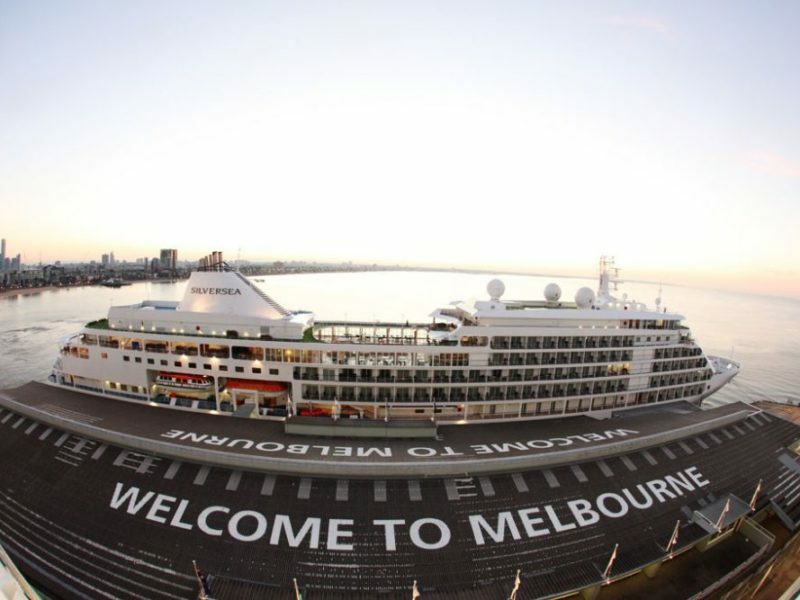 The 186m-long Silver Shadow, built in Italy in 2000, accommodates a maximum of 382 passengers and has 295 crew. It’s beautifully fitted out and has an incredible art collection on board, with signed prints, sculptures and even original works – much of it for sale – from artists including Matisse, Picasso, Dalí, Chagall, Miró and Henry Moore. Our Midship Veranda Suite – a boon for us, as midship rooms are less affected by the ship’s pitching – would have cost $13,958 each for the whole 19-day Auckland-Fremantle voyage, including all food, standard drinks and entertainments. It’s spacious and tastefully furnished. There’s a queen-size bed (with the option to preselect your preferred pillows – naturally), a dressing table, a desk, a bar fridge, a TV, a DVD player, a sofa, an armchair, and a small table that takes a larger, stowable top for room-service dining. Sliding doors lead out to a private verandah, and an additional curtain separates the bed from the living area, in case one half of a couple wants to sleep while the other, say, wants to write an article about cruising. The granite-tiled bathroom has a shower, bath, twin sinks and Bulgari toiletries, with Neutrogena or Ferragamo toiletries also available on request. The only downside is the noisy airliner-style toilet. A walk-in wardrobe has ample space for all your dinner suits and evening dresses – you’ll be giving those a good workout – along with a small chest of drawers and code-operated safe. There’s no iron: ironing has to be done in the laundry, unless you want to get creative with some hair straighteners. Incidentally, all power sockets are US or European, so bring an adaptor. Noise insulation between cabins is only adequate; you’ll hear the murmur of your neighbours’ conversation – and their door buzzer. My only other criticisms would be of the TV (mounted too high), the always-on aircon (temperature is your only adjustment) and the 13 individual light/lamp switches – there’s no master switch by the door. I’ll admit it: I wasn’t looking forward to this trip. Cruises have always been firmly on my to-don’t list, along with, say, bungee jumping in Zambia. Women supposedly forget the pain of childbirth, but I’m not sure if anyone forgets the please-kill-me-now misery of seasickness. And I’ve had some bad sea voyages. But it’s sunny and calm when my wife Sue and I step aboard in not-very-scenic Port Adelaide. While the Silver Shadow has to tie up alongside the grain silos and containers at this industrial dock, she still manages to impress with her beauty and sheer scale. We check in at reception, hand over our passports and collect cabin swipe cards that double as ID cards in port. We set off to explore the ship before a 6.30pm session on emergency procedures (unsurprisingly well attended). Every staff member we pass smiles and says hello. They hail from all over the world (Philippines, Indonesia, Canada, Italy, Russia, Sri Lanka, France) and are genuinely eager to help throughout our cruise, though with only 180 passengers aboard – half its maximum – they may be looking for something to do. In fact the service borders on overattentive, with every glance around a restaurant at dinner bringing waiters scurrying to our table. But someone is always there to offer a steadying arm, carry your plate from the buffet or even loosen the lid of your jam pot. Such assistance is, of course, why many people go cruising in the first place. “Are you a proper passenger?” a rheumy-eyed Briton asks me at lunch. “Um, yes,” I lie, wondering where this is going. “Because you’re about 20 years younger than most of us,” he says with a chuckle. It’s true: anyone on board under 50 is either staff or media. But strangely, it’s the demographic of older and less mobile travellers that makes cruising appealing. It’s a very quiet ship (kids are allowed, but there aren’t any on board) and you won’t be fighting for space in the gym. If you’re after a peaceful escape, this is it. On the subject of noise: the engines are barely audible, but Sue is up at night thanks to the creaking and shuddering. Despite “slight seas” (swells of less than a metre), she’s also affected by the motion during the day. Thankfully, acupressure wrist bands and Kwells prove effective, although she also tries the seasickness cure suggested by one smiling waiter: “A glass of champagne followed by two glasses of wine!” I’m amazed that I’m unaffected by nausea at any point. The days settle into a relaxing pattern: morning tea and newspapers, breakfast, a lecture, gym or pool, lunch, shuffleboard (a cruising staple, and actually good fun), another lecture, reading on deck, afternoon tea, pre-dinner show, cocktail in the bar, then dinner. In fact, we’re just getting the hang of cruising when all of a sudden we’re disembarking at Fremantle. Bugger. I was dubious, but it turns out there’s plenty to do on a cruise – at least for a week or two. Each set of suites has a dedicated butler, and nothing is too much trouble for the friendly staff around the ship. The cheeriness of the staff infects the passengers too, and there’s no label-flashing or pretension. The full cruise in our cabin would work out at nearly $1500 a day. It’s effectively all inclusive, with $1000 credit per suite to spend on excursions or anything else on board (how about the Petrossian Beluga caviar, US$775 for a 50g tin? ), but there are more creative ways to spend that kind of travel budget. It won’t affect everyone equally, and you’ll get over it eventually (probably), but it can be a factor. Cruises are not for internet and mobile addicts. Satellite browsing is slow and expensive at US50c per minute for casual use, though packages are available. A daily newssheet, Chronicles, details the following day’s activities. Classes might include aerobics, Pilates, ballroom dancing, bridge, Russian or French; there are also informal pool volleyball and golf putting sessions; karaoke; trivia; a book/DVD library with daily newspapers from around the world; and a casino with blackjack and roulette. You can use the gym at any time or book massage/hair/nail treatments at the spa; if you prefer retail therapy, there are also two boutiques on board. During each day at sea there are four or five sessions by guest speakers. We had the forthright Philip Hurst talking geopolitics, the amiable Lyn Farmer running wine tastings with Leeuwin Estate’s Denis Horgan, artist Michael Judge discussing the ship’s art, and Barossa legend Maggie Beer conducting an entertainingly frazzled live cookery class. I asked Maggie later if this was her first cruise. “First and last!” she answered, laughing. “I like to be able to see land.” Nevertheless, I have now learnt that almost everything tastes better with verjuice and butter. Another guest speaker, Terry Waite, made for particularly interesting listening. The former envoy to the Archbishop of Canterbury was a successful hostage negotiator until being kidnapped himself in Lebanon in 1987. He was held for almost five years, most of it chained up in solitary confinement. Waite’s sessions were both gripping and moving. Silversea offers a range of additional-cost excursions in each port of call. Port Lincoln has good local galleries, coffee shops and a bronze statue of Makybe Diva, but most of the attractions of the “Seafood Capital of Australia” lie offshore, where you can swim with tuna or sea lions, or down the road at Coffin Bay, with its rather less interactive oysters. Rather than boarding yet another boat, we waited for landfall at Albany, where we’d booked on a US$199-per-head tour to explore the wineries of nearby Denmark. When the tour is then unfortunately cancelled due to lack of participants, we have the luck of meeting some fantastic tourism volunteers, who help us book a car for $65. We then plan our own sightseeing itinerary: firstly to Torndirrup National Park; then the Amity, a replica of the brig that brought the first European settlers to WA in 1826; the Desert Corps war memorial atop the Mt Clarence viewpoint; and finally to the idyllically peaceful Montgomery’s Hill vineyard to sample its delicious 2007 Reserve Chardonnay. It would take roughly a week on board to sample all of the eating/drinking options. Evening dining is mostly formal/semi-formal – not being a tie owner, I had to buy one specially – but there’s nothing stuffy about it. The food is generally excellent but caters almost exclusively for Western diets. Portion sizes are sensibly modest, but if you get hungry there’s always 24-hour room service delivered by your dedicated butler. People used to reliable Australian wines might find the complimentary selection (mostly from Italy, Chile and France) a little underwhelming, but you can always buy wines from the “connoisseur’s list”. Milk is occasionally UHT and you’re unlikely to get a good coffee on board. The Restaurant is the biggest space for breakfast, lunch and dinner; it’s also the most sociable place to eat as you’ll be asked if you want to share a table with other passengers. If you’re particularly hungry, La Terrazza at the stern offers self-service lunches from a mind-bogglingly huge buffet choice. In the evening it becomes an Italian restaurant, with bookings usually required. It’s certainly the pick of the dining options for simple but beautifully prepared dishes. A deck below La Terrazza is the Panorama Lounge, where you can have the full afternoon-tea experience from 4pm. It’s also a good place for a quiet morning tea/coffee/pastry, as is the Observation Lounge, below the bridge on Deck 10. Outside by the pool (weather permitting) is the Grill, where you’re brought a hot rock to allow you to cook your steak/fish to your taste. Finally, adjacent to La Terrazza is the only pay-extra restaurant, the 24-seat, Relais & Chateaux-affiliated Le Champagne. It’s run either in degustation mode, with paired wines to each set course for US$200 per head, or in set-menu mode for US$30, excluding wine. We tried the latter option. It’s the classic French experience of aesthetic precision, complete with teensy but numerous courses and a maître d’ who will firmly correct any inappropriate wine choice – which probably won’t be anything familiar, as the only Australian/New Zealand wine is Penfolds Grange. We were welcomed with a free glass of Heidsieck Monopole. We hadn’t actually realised it was a set menu but chef Stephane Rat (no jokes please) was unfazed when my wife pointed out that she didn’t eat red meat, and whipped up fish or vegetarian substitutes. Wine is only available by the bottle and we only wanted a glass, but the waiters obligingly refilled our champagne glasses instead. It’s a beautiful if formal experience and worth trying at least once. Adelaide-Fremantle, stopping at Port Lincoln (SA) and Albany (WA). 186-194 in total (depending on configuration). Every cabin has a verandah except for the 28m2 Vista Suites. There are also nine 28m2 Terrace Suites that share a terrace. From there, the only way is up, with seven different suite options ranging from the 32m2 Veranda Suite to the two-bedroom, 117m2 Owner’s Suite. 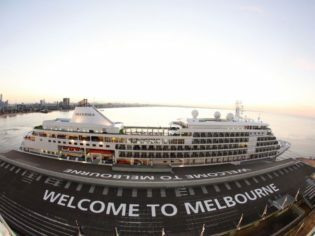 Silver Shadow’s twin sister, Silver Whisper, will be conducting a similar 21-day tour early next year from Sydney to Hong Kong. Fares are priced from $8999 per person twin share.